Ellen Muller's underwater work is featured on InfoBonaire.com. Two new species for Bonaire, thanks to Ellen! Ellen Muller moved to Bonaire from the United States in 1980. 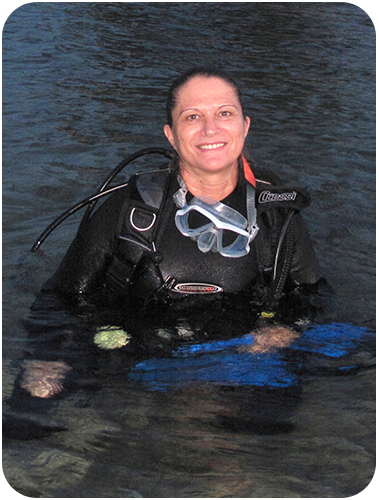 She picked up an underwater camera in 2001 and instantly became hooked on underwater photography. Her passion is being able to share with others the amazing beauty of Bonaire’s underwater world. Her stellar underwater images are featured on InfoBonaire. Ellen has an uncanny ability to find the smallest, most hidden, and concealed creatures. This ability has led her to find, document, and name two new species. Check out her most recent find, the Candy-striped Crab. View a gallery of some of Ellen’s best underwater photography or view more of Ellen’s work on her website. Images available for viewing at Pasa Bon Pizza. Those who prefer not to have to carry a print back home can choose their favorite image directly online, which also gives the added benefit of specifying different sizes. For additional information or to place an order, email EllensBonaireCalendars@yahoo.com.